Make a statement at your next event, conference, trade show or wherever it is that you’re showing off your brand with exhibition displays and trade show displays. 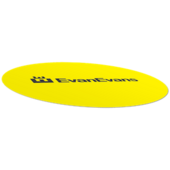 Evan Evans has the highest quality products and everything that you need to present seamless branding across all your products (including a good dose of fun). Capture attention in an interesting way with floor graphics, invite happy snaps with media walls, welcome people with portable counters and help your logo stand out with hanging signs. From corporate events to new bar openings, city festivals to trade shows, we have you covered with exhibition displays for every sort of occasion. 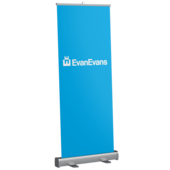 Evan Evans can provide Display Stands in Melbourne and Display Systems Australia wide, with everything you need to advertise your business. We pride ourselves on our high-quality products, and the variety of our exceptional display range is second to none. 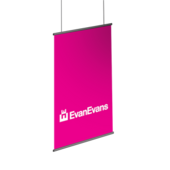 Whether you need display stands in Melbourne to advertise your new café or brand new display signs for a corporate event in Sydney, Evan Evans can provide what you need to ensure you get noticed. One of the most popular display systems in Australia is the simple A-frame sign. A great way to gain exposure for your business, this versatile and portable signage solution is perfect for turning sidewalk traffic into customers. If you’re looking for display signs that are easy to set up, cost-effective, and attention grabbing, A-frame signs tick all the boxes. Similar to the A-frame sign, the ECO Flex is a value-for-money sign holder that’s ideal for use on sidewalks, roadsides and forecourts. With a low centre of gravity and excellent flexibility, the ECO Flex is a durable and cost-effective way to advertise. Standing at 1600mm high, our eye-catching 2Stand Display Stands Melbourne and Display Systems Australia wide is an excellent way to advertise your business or exciting new product and is particularly well suited for exhibitions and trade shows. Fully customisable, our 2Stands feature full colour, high resolution images that make them really stand out in the crowd. 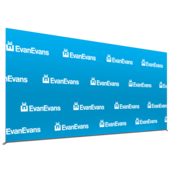 Perfect for stage and media backdrops, our E-frames are an affordable and eye-catching solution. If you need display signs that can be wall mounted, freestanding or suspended, are able to be flat packed for easy transportation, and are cost-effective, E-frames might be just the thing. ISO Frames can be put together quickly using the handy tool-free FASTclamp connector and are perfect for trade shows and exhibitions. Easily transportable, the ISO Frame can be clad in rigid, semi-rigid or flexible graphic panels, is completely re-usable, and is available with optional built-in LCD screens. 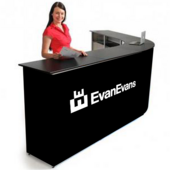 When you need Display Stands in Melbourne and Display Systems Australia wide to get your message seen, give the experts at Evan Evans a call on 1800 990 989. We’ll be happy to discuss your display sign needs with you and provide a solution that’s tailored to your requirements.